New Zealand’s Battle of Passchendaele 100th anniversary was commemorated by tens of thousands throughout New Zealand and also in Belgium. The day was a huge ‘success’ if I may use that word, a befitting culmination to all the hard work put in by the Board members in particular over the years. The media coverage also exceeded our expectations. Many thanks to our members who helped in the various arenas, I hope the day was as memorable as mine was in Belgium! The Passchendaele Centennial Commemoration at the Auckland War Memorial Museum attracted a full house of 550 to 600 attendees, not including participants. Sir Don McKinnon and MajGen Tim Gall were the guest speakers this year and many thanks must be expressed to the RNZ Navy Band and the Auckland Choral for their support and to Ken Young for his painstaking organisation. We were also supported by Fields of Remembrance Trust (FoRT) who established a field of 2,412 named crosses in the Auckland Domain in memory for all those that died in the Battle of Passchendaele during our involvement in that battle between October 4th to October 20th when we were finally relieved. After the commemoration, all attendees were invited for complimentary refreshments, courtesy of Auckland Council, served in the Events Centre upstairs at the Museum, where Mike Pritchard was presented with a copy of the Memorial Garden Plaque by Hon Maggie Barry MP (Minister for Arts, Culture and Heritage). Mike worked tirelessly on the project before he fell ill and was quite moved by the presentation. Later, there was a formal dinner at the Northern Club, hosted by the Auckland Officer’s Club – again there was capacity attendance. In Belgium, we woke to a beautiful autumn day with no wind and most importantly, no rain like there was 100 years ago! The national commemoration at Tyne Cot Cemetery saw HRH Prince William and Princess Astrid of Belgium leading the line-up of VIPs as we all gathered in front of the New Zealand Memorial to the Missing (Battle of Passchendaele, 1917). Both guest speakers spoke beautifully remembering those that had come from the uttermost ends of the earth and ultimately gave their lives. We were then delivered to the Zonnebeke Chateau for a BBQ lunch, followed by the very special opening of our New Zealand Memorial & Garden by Dr. Nick Smith MP. Next, we were bussed to Polygon Wood for the dedication ceremony of the new Wood of Peace. Participants were thrilled to discover a huge field of poppies at the peak of their blooming and I can tell you hundreds of photos were taken! There were several other events held over a period of about 10 days, including the packed-out Last Post Ceremony under the Menin Gate on October 11th! Photos of the various events will be posted on our website shortly, so please keep an eye on that. A commemorative book show-casing the various events is also being produced by FoRT with the help of the Passchendaele Society. Many thanks must also be expressed to Penny Hartill, our media representative, who helped to get the media’s attention to the centennial events throughout the country. Continuing our story – the Battle of Passchendaele was of course longer than just one day and New Zealand suffered many more casualties before finally being relieved on October 20th by the Canadians. All told, 2412 New Zealand boys lost their lives trying to capture the Passchendaele Ridge. The winter of 1917 was at the doorstep and the New Zealanders were not done with Belgium – they continued to operate in the Ypres area until February 1918. The waterlogged conditions, bleak winter weather and depressing memories of the Passchendaele fiasco combined to make this a particularly trying experience for the survivors. Another failed attack, this time at the nearby Polderhoek Chateau between 3rd and 12th December 1917 added to their misery. The entire terrain had been shelled to pieces by the British since October 1917, the Chateau itself was a ruin but remained in German hands. The New Zealanders’ job was to attack the Chateau to improve the defensive position in the sector. The capture of the dominating Polderhoek Spur on which the Chateau stood would prevent the Germans from threatening the New Zealanders’ trenches to the north. The enemy had numerous strong points in the ruins of Polderhoek Chateau and in nearby pillboxes. The Reutelbeek (Reutel Creek) which originally flowed through the grounds of the Chateau now formed a wide area of marshland separating the two sides. At noon on 3 December, men of the 1st Canterbury and 1st Otago Battalions clambered out of the support trenches opposite the Chateau, about 180 metres away. The New Zealanders pressed forward against intense machine-gun fire, overcoming a number of enemy strongpoints, but they were eventually forced to go to ground. The frontline had been pushed forward slightly, but the Chateau remained out of reach. A strong west wind ruined the smoke screens and the British artillery failed to suppress the German machine-guns, which forced the attackers under cover. The rush failed, some of the British artillery-fire dropped short on the New Zealanders and the Germans engaged the attackers with small-arms fire from Polderhoek Spur and Gheluvelt Ridge. New Zealand machine-gunners then repulsed a counter-attack by German parties advancing along the Becelaere Road. The New Zealanders were 150 yards (140 metres) short of the first objective but another attempt after dark was cancelled because of the full moon and the observation of German reinforcements reaching Polderhoek Château. About 80 soldiers lost their lives, plus hundreds more were wounded. The futility of the attack was underscored nine days later, after the New Zealanders had withdrawn from the line, when the Germans regained all the ground they had lost on 3 December. The Victoria Cross was awarded to Private Henri James Nicholas for his exemplary conduct during the assault. The all-important post-centennial AGM will be held on Thursday 22nd March at the Auckland War Memorial Museum at 5pm in the Auditorium (enter via the Atrium). Discussion about the direction and future of the Passchendaele Society will take place, with two Board retirements having been notified thus far, including our President Iain MacKenzie, whose term has ended. The Board are extremely proud to have achieved our Society’s goals for 2017 with huge success, including Raising Awareness of the Battle of Passchendaele; opening the New Zealand Memorial & Garden in Zonnebeke; sending Young People to Passchendaele; and of course the hugely successful 100th Anniversary Commemoration at the Auckland War Memorial Museum. So you can understand at the end of it we all patted ourselves on the back for a job well done, but then began to think “what next”. So we are asking members also to ask that question and to share their opinions in writing before our next Board meeting in February so we can discuss before the AGM and if necessary, reassess. The DVD of our Centenary Ceremony at Auckland War Memorial Museum on 12th October 2017 is now available for purchase. It is an excellent record of a memorable occasion. If you wish to order a copy or copies, they are $15.00 each plus postage & packing (per item) – within NZ + $5.00; to Australia + $8.09; to Pacific Islands + $11.84; to USA, Europe and rest of the world + $14.59. No handling charge if you are able to collect. So that we may place one order with the supplier, please reply to Secretary Bob Davis by 6th December. We will try to dispatch them before Christmas, but cannot guarantee this. The Youth Group played a key role in the opening of the New Zealand Memorial & Garden at Zonnebeke and were also present at the Sunset Ceremony as a finale to their visit to Flanders Fields. The judges were impressed with the digital map that navigated users through this website. It provided a coordinated story of the Battle of Passchendaele with provocative questions, a brilliant German photo album and some great quotes providing a New Zealand context. It had excellent interactive tasks for the students to complete. St Paul’s Collegiate, Hamilton https://bloodandmud.org/ by Dylan Woodhouse, Tony Wu, Lucy Tustin and Conor Horrigan – The students created a website which had interactive activities and strong links to the curriculum. The judges were impressed by the use of social media, community engagement and provocative questions. They applauded the website’s ability to address diversity, connect the past with present and encourage students in Years 7 to 10 to engage and do their own research. It had the standout “wow factor”. Rotorua Girls’ High School, Rotorua http://themissed.000webhostapp.com/ by Alyssa Mae Pineda, Kayla Kautai, Mairaatea Mohi, Atawhai Ngatai and Keighley Jones The students created a scrolling menu of pages on their website that detailed different aspects of the battle, a quiz to test learning and material in Te Reo Maori. The website impressed the judges because it enables students to think critically about the Battle of Passchendaele. Martinborough’s Young Bacchus Vineyard Estate earlier this year released a very special commemorative Cabernet Sauvignon/Merlot 2015 vintage related to New Zealand’s involvement in World War 1 which may be of interest to you both as a quality wine but also as a collectable as only 600 bottles were produced, each being individually numbered. 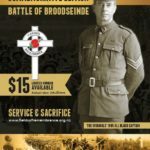 The grapes for the wine were picked beginning at dawn on Anzac Day 2015 & was released for sale on the 100th anniversary of the end of the battle of Messines on 14 June 2017. As there are still some available, Young Bacchus Estate has kindly offered them to Passchendaele Society members at a discount of 10% until the end of the year – just mention the Passchendaele Society when making your order. The cost per 6 -bottle case is $165 (less 10%), delivery included. Email youngbacchusestate@gmail.com or Telephone 06 306 8288 to order.